Welcome to the Leadership for Introverts book web site. The print version is now available at Amazon.com! The book is currently available in several Ebook formats. Click here for the list. It’s time for Serious Growth as an Introvert Leader. Introverts can make Great Leaders… with the proper training. And now there is a book specifically for Introverts on how to do just that! Some see introversion as a weakness, but it is not. Quiet has Power (think about those awkward silences) and it is time to embrace the Power of the Introvert. Introverts make up half the population of the world, if not more. That means extroverted leaders are not communicating properly with half the people they lead. Let’s show the world how our quiet influence can shape the future. Learn how to draw from your well of strength so you stop getting that anxious feeling in social situations. Explore ways to take your Introverted Leadership skills to the next level. In “Leadership for Introverts,” Ty Belknap (having a Doctorate in Leadership) argues that it is time for quiet, unassuming people to shed the shy title, rise up and show the world the Power of Quiet. There are hints and tips for working with extroverts, recharging in high-demand situations, and even “For Extroverts” areas to help them understand introverts more. Whether you need help working with teams, handling social situations, leading an extroverted child, or designing a retreat that will work for both extroverts and introverts, this is the book for you. 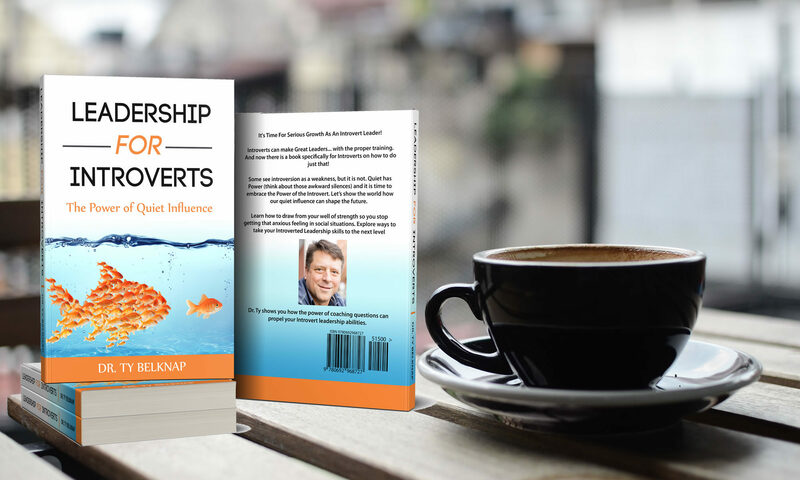 and with sections on how introverts can master networking, marketing, and even leading extroverts, “Leadership for Introverts” will forever change the way you see yourself. Dr. Ty will show you how the power of coaching questions can propel your leadership abilities in ways extroverts would struggle to achieve. Get notified when this site gets updated and information about my books (I won’t spam you, I hate that).